LimeSurvey is an open source application; simply install it and create online surveys. It is completely free tool, download source code and modify it to your needs if you like, but it’s default features should suffice for creating any kind of surveys. It is available in 80 languages, so you can easily create surveys using your native language. You can create unlimited number of surveys using this tool and it lets you create surveys of unlimited length. Such a fantastic and feature rich application available without any cost, is no less than a blessing. Let’s see how we can install this awesome open source application, please note that it is developed in PHP and uses MySQL on the backend for database related operations, so here are pre-requisites for this application. We must have following three packages installed on our Linux system before we attempt to install LimeSurvey. In order to install these components, launch your system terminal and install lamp-stack. Lamp stack comes with all these components so it should suffice our needs. 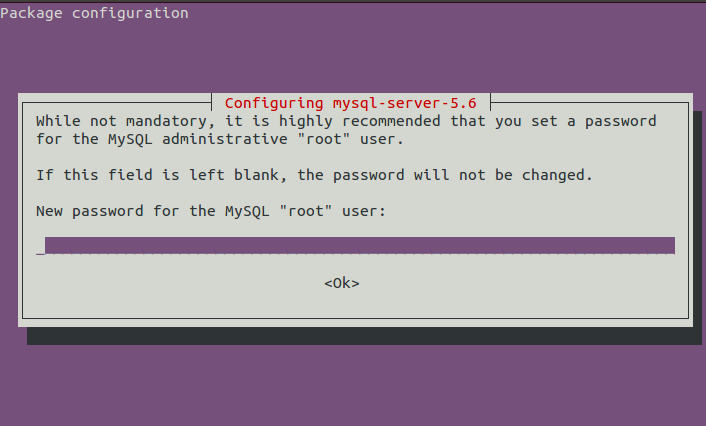 During the installation process it will launch a pop up to specify mysql root password, note down the password you set here as it will be used later when installing LimeSurvey. Once the installation of LAMP is complete, run following command on the terminal to start apache web server. Launch your web browser and load http://localhost – successful installation of apache web server should display a page as shown below. Important note: By default Apache document root is /var/www/html. We need to place our web scripts in this directory so that Apache may serve them successfully. 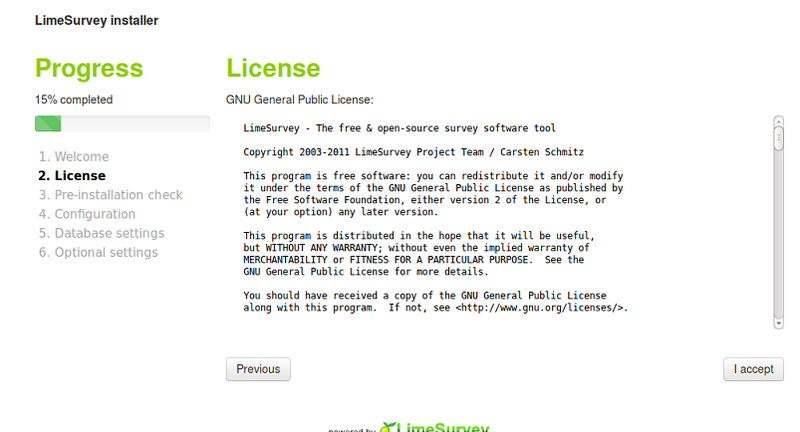 Our Ubuntu system is all set to install LimeSurvey now. Download the latest version for this application from following URL. Once the download process is complete, go to the download location via terminal and run following command to move the downloaded file to Apache document root. Here, run following command to unzip the LimeSurvey downloaded file. Give writable permissions to limesurvey directory for the installation purposes. 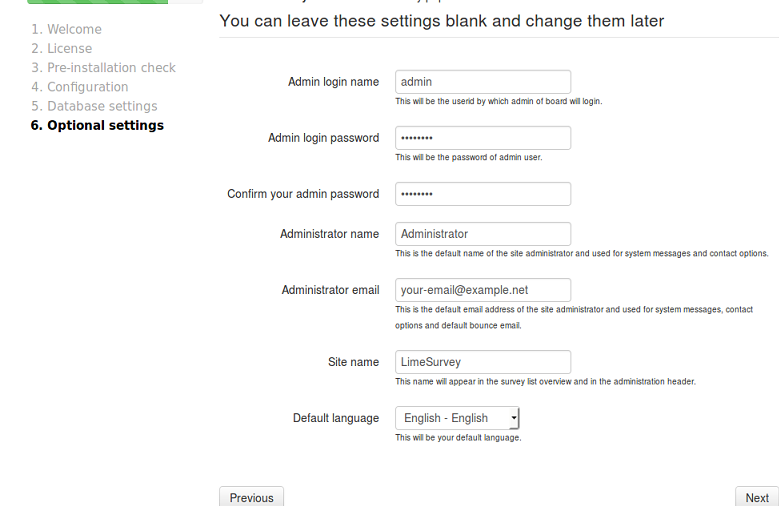 Launch http://localhost/limesurvey address in the browser now, it should display the installation page for limesurvey. Here click “Start Installation” . Accept License Agreement from this step. 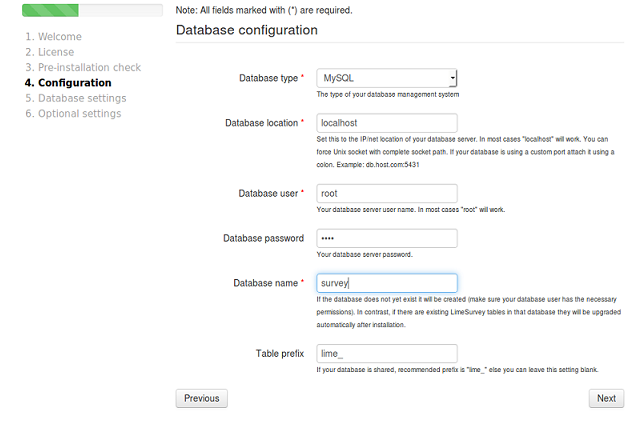 Specify your database credentials from this step, provide mysql root logins and specify what name you want to give to the database for this new installation. Installer script will create database itself on the backend with specified name, click “Next” once done. 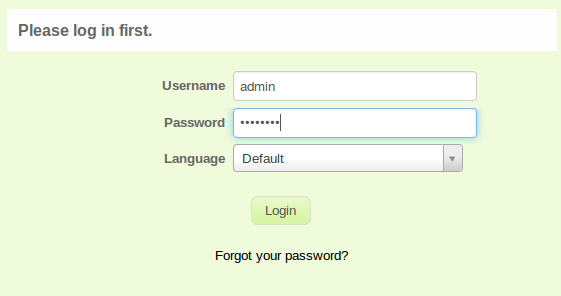 Here are some optional settings, you can change default username and password for admin user from here. You can set your email account or survey site name from here too. Click “Next” to proceed further with the installation process. There you go, the installation is complete now – click “Administration” option to login the admin panel for your survey application. It is a feature rich application, easy to install and use. LimeSurvey has rich internet community and help available. It’s source code is simple and well optimized; any PHP developer with intermediate level of development skills can modify it to customize to your needs. Great article! I have successfully installed limesurvey on my CentOS machine using this and the guide below. (1) “chmod –R 777 limesurvey” – The hyphen is wrong and doesn’t work. It should be a minus sign: “chmod -R 777 limesurvey”. Also, it requires “sudo”: “sudo chmod -R 777 limesurvey”. (2) “http://locahost/limesurvey” – there is an “l” missing. It should be “http://localhost/limesurvey”. (3) The Apache document root may have been changed from the default /var/www/html. In my case it seems to have been changed in the installation of other software using the mysql database, and is /var/www. Thanks a lot for your comment and pointing out typos, they have been corrected now! Thank you so much for this instructional! The LimeSurvey site was of no help. I did have to install PHPxml ~ sudo apt-get install php7.0-xml ~ to finalize my installation. Everything appears to be up and running great now. Thanks again!